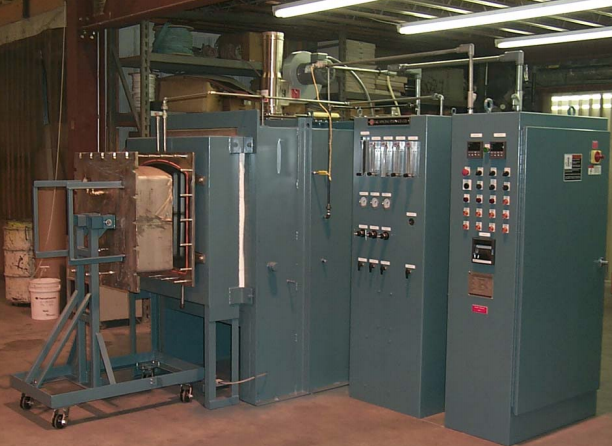 High Uniformity Atmosphere Controlled Box Furnace - L&L Special Furnace Co, Inc.
L&L Special Furnace Co., Inc. has manufactured a high uniformity box furnace used for hydrogen annealing. The furnace has been supplied to an industry leader that manufactures aerospace, medical and research and development supplies to a worldwide client base. Steel hydrogen annealing is a treatment of steel where it is heated to and held at a specific temperature, followed by a controlled cooling process. It is a heat treatment process to remove oxygen, carbon, sulphur and other impurities. The process also prevents hydrogen embrittlement. The primary purpose of the furnace is to evenly heat to an internal stabilized temperature of 1,750°F. The furnace is held at this temperature for a predetermined amount of time and then cooled using an external venturi cooling system. The furnace is first loaded with product in a work envelope of 17” wide by 17” high by 25” deep. It is then purged with 10 volume changes of nitrogen or until the oxygen level is below 1%. After that, the furnace is capable of introducing hydrogen up to 100%. The dew point of the hydrogen entering the furnace is -40°F or better due to the use of all stainless steel lines. The furnace control system is driven by a Honeywell HC900 control system with touchscreen. This computer-based control system includes a CPU and operator interface with Ethernet capabilities. Modular construction makes the HC900 expandable, with many input and output options. HC900 software monitors and logs all of the thermal data from a remote computer. The furnace is divided into six zones, each with independent PID loops. The thermocouples are type K and allow for consistent operation at 1,750°F. Options include mass flowmeters, dew point analyzers, ammeters and voltmeters. All units come with a three-day all-inclusive startup service within the continental US and Canada. International startup and training service is available by factory quote. The furnace has been surveyed and is capable of ±10°F at 1,750°F throughout the work envelope. If precise temperature control and uniformity is a key to your process, then L&L’s XLC series is a great choice. L&L also has many other sizes available.